Natchez Wilderness Preserve is a thousand trails campground. Kevin and I are elite members of thousand trails. We found a campsite by the lake for an extra fee of $10.00 a night. The campsite has lakeside access, fire pit, full hookups, gravel campsite and a good view. The staff BBQed a pig for memorial day and had a raffle. We didn’t win anything but we had a good conversation with fellow campers. At the red barn, a band played for a few hours. I liked the music until a thunderstorm interrupted the band playing. We were already in the RV nice and cozy when the storm started. The thunderstorm took out two trees in the park. We sat in front of the RV watching the thunderstorm. It was magnificent. The next day the sun came up. We enjoyed the lake swimming and relaxing outside our RV identifying birds. Kevin and explored the Meriwether Lewis Burial site. This is Lewis from the Lewis & Clark Exhibition. Lewis was on his way to Washington to explain his finances when he was found shot twice. There is some controversy on how he was shot. Did he commit suicide? or was he murdered? We also walked the Natchez Trail for a bit. I felt very much in awe of the people who walked this trail and the history behind it all. I couldn’t find the National Historic Site stamp here but the site was worth the stop. Yoder’s Homestead Market: This is an Amish/Mennonite store. I admire their commitment to something they believe in. The sandwiches and pastries were supposed to be excellent. We weren’t disappointed. The ladies that worked the store were dressed like an Amish/Mennonite person. One of them warmed up a cinnamon pecan twist for us. It was nutty with the perfect amount of drizzled frosting. We had the ham & cheese special for lunch it was excellent. The bread was exceptional. It tasted soft and fresh. The Amish/Mennonites know how to make food. 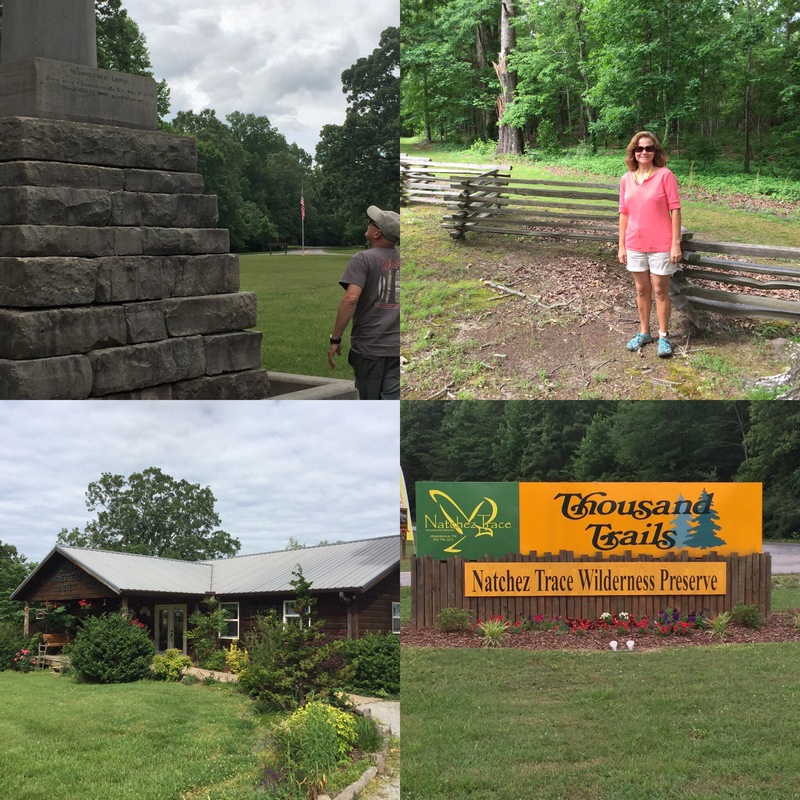 This entry was posted in None and tagged camping, Memorial Day, Meriwether Lewis, Natchez Thousand Trails, Natchez Trace Trail, Natchez Wilderness Preserve, rving, Thousand Trails. Bookmark the permalink. We were at the other end of the NT in MS. We’re hiking the high peaks in the Carolina/TN areas now so we’re heading to Rocky Bottom, SC. The pig feast looked delicious!